The Wildcats played hard through harsh weather and turf conditions in the 0-0 draw at Indiana on Sunday. The soccer team improved their season record to 3-2-2 while earning their fifth shutout. 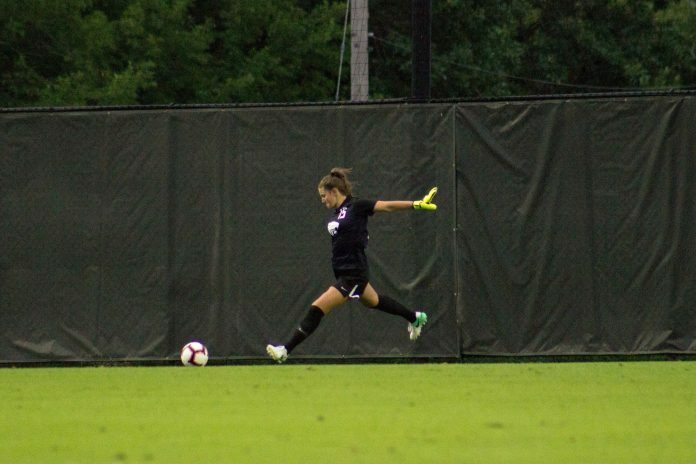 Emma Malsy, a redshirt sophomore goalkeeper, had herself a game as she set a career-high 11 saves, tying the school record for shutouts in a single season in the fifth shutout. Her 11 saves marks her first game with double-digit saves. Indiana’s Mykayla Brown had a chance to give Indiana an early lead in the 14th minute of the first half as she took advantage of a good look. Malsy got a hand on the ball with a punch, but that wasn’t enough for the save as the ball bounced off toward the opposite goal post. K-State’s Morgan Egan was set at the post and kicked the ball away to prevent the goal. Indiana controlled the game as they had the edge on the Wildcats in total shots and shots on goal. At halftime, the Hoosiers held a 9-7 advantage in total shots including 5-3 advantage in shots on goal. In the second half, the Hoosiers dominated in total shots with a 19-5 advantage, but only tallied one more shot on goal with a slight 4-3 advantage. The match went into two overtimes; the Hoosiers controlled the first overtime as they recorded three shots on goal. Malsy continued her career-high performance as she saved all three of the Hoosiers shots. In the second overtime, K-State had two solid chances to score but were unable to get any shots past the Hoosiers. Three minutes into the second overtime, freshman forward Chloe Fisher stole a crossed ball from sophomore midfielder Brookelynn Entz in the Indiana penalty area and sent a shot that just missed the left post. Junior forward Katie Cramer had a good look as she sent a low shot toward the goal but Kopel made a diving save. The Wildcats will now head home and host the Missouri State Bears on Friday. The Bears will come into Manhattan with a 5-4 record and are coming off a 0-3 loss to Saint Louis. The Wildcats will head into the match with a 3-2-2 record after coming a draw against Indiana. This match will be at 7.p.m. Friday at the K-State Soccer Complex. 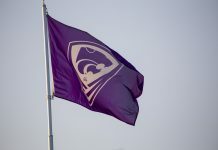 The match will be broadcasted on FCS Pacific, K-StateHDTV and 101.5 KROCK, and can be followed at kstatesports.com.